Be the first to review this 2018 Kia Sorento. Redesigning for the 2016 model year gave Kia’s largest crossover SUV an elegant new look. Though more generic than distinctive in appearance, the reworked Sorento fits in the heart of the crossover category. Detail changes mark the 2018 model year, starting with enhanced headlight performance and revised front headrests. A rearview camera and automatic headlights now are standard on the base model. LX trim gains a standard third-row seat, when equipped with all-wheel drive. EX models add a hands-free power liftgate, and the EX V6 gains autonomous emergency braking. Especially in EX trim with the turbocharged engine, the Sorento incorporates all the typical crossover-SUV characteristics. An upscale, substantial overall feel is matched by a well-damped ride and a broad choice of configurations. Five trim levels are available: L, LX, EX, SX, and SX-L (Limited). In base L and step-up LX models, a 2.4-liter four-cylinder engine makes 185 horsepower and 178 pound-feet of torque. EX trim upgrades to a 2.0-liter turbo four that develops 240 horsepower and 260 pound-feet. Both engines mate with a 6-speed automatic transmission. L and front-drive LX models have two-row seating. Others contain three rows for seven-passenger capacity. Though it’s more powerful, generating 290 horsepower and 252 pound-feet of torque, Kia’s V6 engine, also driving a 6-speed automatic, feels less enthusiastic than the turbo four. Optional all-wheel drive includes a locking center differential. Crash-test scores rank highly in the crossover SUV category. The Insurance Institute for Highway Safety has named the 2018 Sorento a Top Safety Pick+, with Good scores in each crash test. However, the "plus" designation applies only to top models with V6 engines, whose HID xenon headlights have been rated Acceptable. Sorentos with autonomous emergency braking promise Superior frontal crash protection. The National Highway Traffic Safety Administration has given the 2018 Sorento five stars overall, along with five-star ratings for both frontal and side impacts. Some of the latest safety technology is available, either optional or standard on upper models. All Sorentos have a rearview camera and Bluetooth connectivity. Advanced safety features that can be fitted into most trim levels include adaptive cruise control, forward-collision warning with automatic emergency braking, and blind-spot monitoring. Optima L ($25,800) comes with the base 2.4-liter four-cylinder engine, front-wheel drive, two-row seating, remote keyless entry, cloth upholstery, 6-speaker CD audio, satellite radio, Bluetooth, heated power mirrors, 17-inch alloy wheels, and a rearview camera. (Prices are MSRP and do not include destination charge.) All trim levels except L can be equipped with all-wheel drive. Optima LX ($27,100) adds rapid-charge USB ports, an acoustic-glass windshield, and a roof rack. All-wheel drive ($2,790) includes three-row seating. Optima LX V6 ($29,500) substitutes the V6 engine and has three-row seating. Front-wheel drive is standard, but all-wheel drive is available ($1,800). Optima EX ($33,000) comes with the 2.0-liter turbo, front-drive, two-row seating, 18-inch wheels, leather seat trim, heated power front seats, dual-zone climate control, power liftgate, rear parking assist, and blind-spot detection. Android Auto and Apple CarPlay is included. All-wheel drive is optional ($1,800). Optima EX V6 ($34,100) substitutes the V6 engine and has three-row seating. All-wheel drive is optional ($1,800). Optima SX V6 ($39,100) adds a panoramic sunroof, 10-speaker Infinity audio, 10-way power driver’s seat, 19-inch wheels, and navigation with an 8.0-inch touchscreen. All-wheel drive is optional ($1,800). Optima SX-L Limited V6 ($44,400) comes with forward-collision warning, automatic emergency braking, lane-departure warning, adaptive cruise control, surround-view camera, xenon headlights, and Nappa leather. All-wheel drive is optional ($1,800). In its current form, the Sorento conveys a sense of balance. Standing well ahead of previous Sorentos, the look is neatly elegant. Smooth sheetmetal edges create a handsome profile. Nothing is excessive. Up front, the Sorento’s grille, though prominent, is less exaggerated than on some crossover vehicles. Body panels are softly sculpted, accented at corners by LED lighting, with appropriate yet restrained levels of chrome. Modification of the cabin as part of the 2016 reworking propelled Sorento forcefully up the sophistication scale. Soft-touch plastic trim and supple front-seat upholstery help give the impression of a luxury SUV. The cockpit comes across as polished and well-organized. Controls are grouped into logical, enclosed zones on the wraparound dashboard. Front seats are sculpted effectively, similar to those found in premium makes. Cushions are marvelously supportive, augmented by extendable thigh supports. Second-row seating is less impressive. Three occupants fit, but sit low. Contouring of bottom cushions isn’t sufficient for adults, and the ill-shaped bench is short on support. With a panoramic roof, headroom is scant. Second-row seatbacks fold to ease access to the third row, which is roomier than some. Climbing back there isn’t too tough, but legroom could be better. Cargo space is adequate but far from vast. Volume totals 38 cubic feet with the third row folded, shrinking to 11.3 cubic feet with all seatbacks up. Occupants can expect an impressive sense of solidity, amplified by highly composed handling capabilities. Electric power steering is nicely tuned, allowing faithful tracking on the highway. Brakes modulate easily. 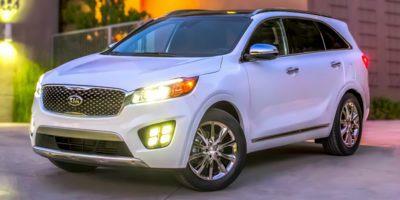 As a result, the Sorento delivers an admirably fluid driving feel. Ride quality is well-controlled, resulting in a quietly poised highway experience, matched by satisfying levels of confidence. Well-behaved powertrains can deliver frisky acceleration, especially with the turbo engine, marred by just a touch of turbo lag. The turbo works well with Kia’s automatic. A V6 Sorento feels strong when starting from a standstill, followed by undramatic acceleration to road speed. Although the automatic transmission generally shifts smoothly, some ΓÇ£shift shockΓÇ¥ may occur with the V6. Kia’s Drive Mode Selector has Eco, Comfort, and Sport modes. Transmission shift points and steering are altered, but the rather sensitive engine throttle is not. Even though an all-wheel-drive Sorento is no hardened off-road machine, 7.3-inch ground clearance permits a fair amount of potential after the pavement ends. A lockable differential keeps front/rear power split at 50/50. Electronic torque-vectoring can apply brakes as needed to help the Sorento steer more accurately. Fuel economy is reasonably good, though not exactly frugal. With front-drive and the 2.4-liter engine, the Sorento is EPA-rated at 21/28 mpg City/Highway, or 24 mpg Combined. Turbo power is EPA-rated at 20/27 mpg City/Highway, or 23 mpg Combined, with front-wheel drive. All-wheel drive drops the estimate to 19/27/22 mpg. With the V6, an all-wheel-drive Sorento is EPA-rated at only 17/23 mpg City/Highway, or 19 mpg Combined. A front-drive V6 manages 18/25/20 mpg. Even the base L edition is amply-equipped, with some options available. All Sorentos yield a solid upscale feel, as passengers enjoy a quiet cabin and a nicely-controlled ride. Best powertrain choice is the responsive turbo four-cylinder, which is significantly thriftier than the V6.